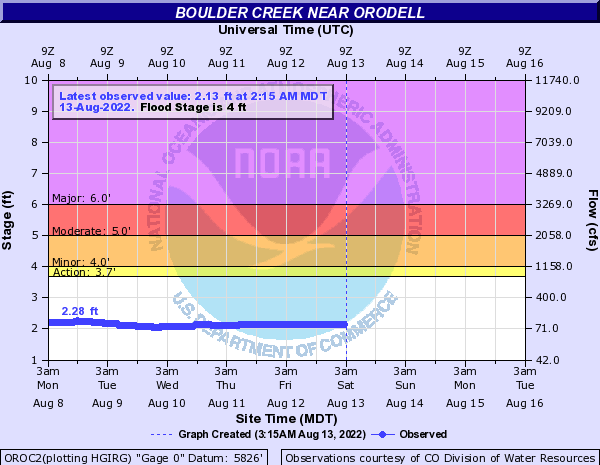 This describes the stretch of Boulder Creek from an obvious Blue Bridge to the put-in bridge at 4 mile canyon for the lower section. It is slightly steeper than the lower canyon but with a similar character. There is one class V- rapid by an obvious massive rockpile that can be seen from the road. It comes around a left bend and can be run either far right, driving back center or over a sweet boof left-center, driving back right. There are two dams after this drop that should be scouted before running. The first dam can be seen from the road. The author has had a horrible piton here at lower water, thinking he knew the line. The second is by the powerplant near the tunnel. It is usually run a little off the right wall. Although the whitewater is fairly straightforward, the water tends to be fast and continuous and it's not a friendly place to swim. Also hazards abound: wood, overhanging trees, manmade dams, and old naked men. When the flow goes above 700 cfs, I think this combined with the lower section is one of the most fun runs in the area and right in my backyard. Flows: 450cfs is a good minimum and the creek almost never sees a flow too high to run, but every 100 cfs is a big jump in this small creekbed. At flows over 800 cfs the creek will feel fast and furious with few eddies. Be extremely careful of low bridges at higher flows. Put-in: At blue bridge or as high up as looks good (it gets steeper the further up you go). Take-out: 4 mile canyon, but most will want to combine this with Lower Boulder Canyon into the park.